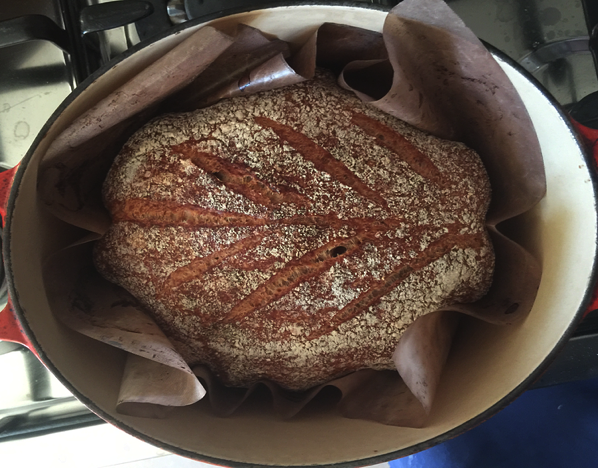 A couple of weeks ago I wrote briefly about trying a new approach to my 50% wholewheat loaf. 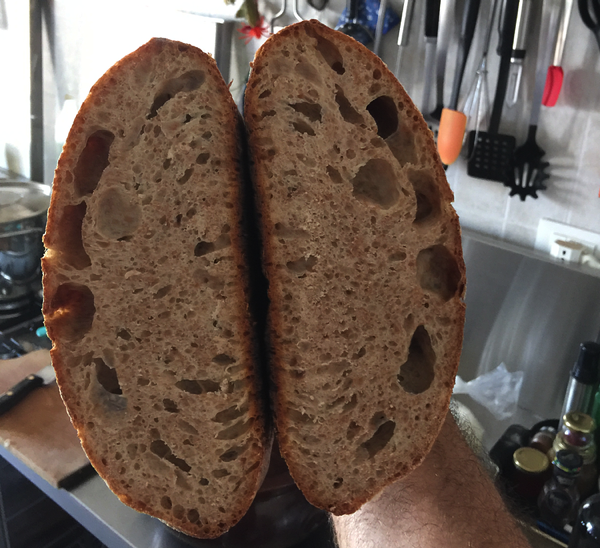 The results were good enough to make me want to try again, after having found some good strong Manitoba flour. And all I can say is, I’m impressed. I’m not going to repeat the recipe here. All the details, and lots of explanation, are on Trevor Jay Wilson’s website, and I have little to add. The secret is the very long autolysis. The idea is to wet the flour before adding any leavening at all. There are lots of good reasons to do this. It fully hydrates the flour, which gives the process of gluten formation a headstart. It also gives some of the enzymes in the flour a chance to convert starches to sugars, providing more food for the leaven and a slightly sweeter crumb. But the real key, with wholemeal flour, is that it softens the sharp-edged bits of bran in the wholemeal flour, with the result that they don’t do nearly as much damage to the gluten network. And that means a better rise and more oven spring. I’ve done relatively brief autolysis before — half an hour or so. But Trevor calls for an overnight autolysis. That’s the big difference. What goes into the fridge a shaggy mass is almost a fully fledged dough next morning. (You take it out of the fridge just before bed time to let it gradually come up to room temperature.) Then it is just a matter of working in the starter, doing a few increasingly gentle stretch and folds, shaping, proving and baking. And the result, this time, was beyond my expectations. The cross section doesn’t really do justice to the open, airy texture. And the flavour was good too. Not too sour, nor really sweet, but chewy and good. 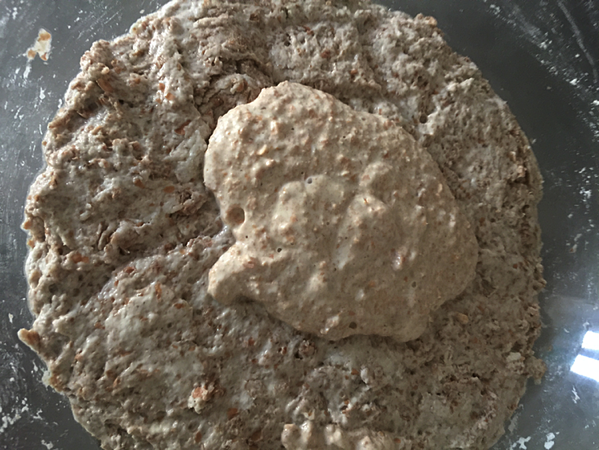 I think I’m sold on an overnight soak now for anything that contains more than a smidgen of wholewheat flour, and am currently waiting for my standard 50% wholewheat with a multigrain soaker to finish proving so I can see whether it makes any difference to that loaf.